We're almost close to be going back to the moon again. And this time, it's not for scientific purposes. It's more industrial. We are going to be mining the moon! Check the video below on the benefits on mining on the moon. National Aeronautics and Space Administration (NASA) has partnered with Astrobotic Technology, a spinoff of the Robotics Institute at Carnegie Mellon University. The purpose of the partnership is to mine the moon for water and fuel. With the recent budget cuts NASA received due to a slowing US economy, the space agency has been going to private companies to augment its funding and even research. Aside from Astrobotic, NASA has also partnered up with the Sierra Nevada Corporation to produce a Space Taxi (The Dream Chaser) that would ferry passengers to space and back. 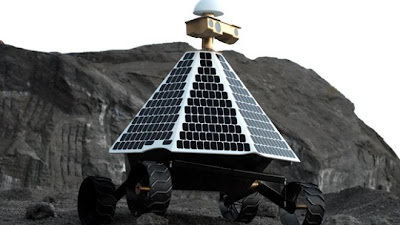 Reports say they have negotiated 7 contracts with Astrobotic, including one that will develop an excavator and also others to give NASA info on how they will help achieve its mission and conduct mining operations at a low cost. Aside from water, their mining operation will also target minerals such as methane and ammonia. Researchers are sure that these exist beneath the moon's surface. They just have to study how much and what form these minerals take in the lunar landscape. David Gump, president of Astrobotic says, "We'll have a field-tested robot that will be able to go to the poles... The readings ... indicate there’s pretty substantial water at the poles, but we won’t know more until you go and take samples. So we’ll both confirm the readings taken from orbit and discover how the resource is spread out." They also have secured corporate sponsorship in exchange for bringing cargo of around 240 pounds to the moon. These include scientific instruments needed to test the lunar surface. Also, if successful, they will also win Google's Lunar X Prize of US$20 Million for returning to the moon. Another thing the company wants to focus in is the mysterious Helium 3. A rare element on the moon deposited by the solar winds. Many believe that is going to be a major element for fusion reactors. Current reactors use fission. This involves radioactive fuel and creates huge quantities of heat. Mining this mineral would certainly benefit energy production here on Earth if research holds true. Gump says, "If we can convert to a fusion fuel cycle, it’s carbon free and radiation free... It could really improve things on Earth and be the basis for a very benign and cost-effective way to stabilize our civilization."